This is Ottolenghi magic right here. A seemingly unassuming recipe; the combination of 3 rices, plenty of herbs, spring onions and fried onion instead makes for a dish bursting with flavour and texture and is just downright delicious. So delicious, that I would even forgo the roast chicken next time as it’s the rice that’s the star here. Next time I think I’ll tweak the recipe to use a little more brown and red rice and maybe more fried onion in place of the chicken. As with most Ottolenghi dishes, this is best served with one or two other dishes – perhaps a tomato salad or some stir-fried greens. Try serving it piled high on a large serving plate. Happily, it will also keep in the fridge for several days and is perfect for lunchboxes. Note: I used puy lentils instead of red rice in the picture above as I couldn’t find red rice. Cook the brown and red rice in 3 times its volume of water for 40-45 minutes, or until tender. Drain off any excess water and rinse in cold water. Drain thoroughly. Meanwhile, cook the basmati rice. Measure the rice in a measuring jug or cup and tip into a saucepan. Add the 1½ times the volume of water and a pinch of salt. Bring to the boil, then turn the heat down as low as possible and cook for about 10 minutes, or until all of the water is absorbed. Turn off the, remove the lid and cover the pan with a tea towel until needed. Heat a little oil in a frying pan and cook the onion, with a pinch of salt,over a low heat for 10-15 minutes until completely soft and caramelised. To make the dressing, whisk all the ingredients together in a bowl along with any chicken juices. 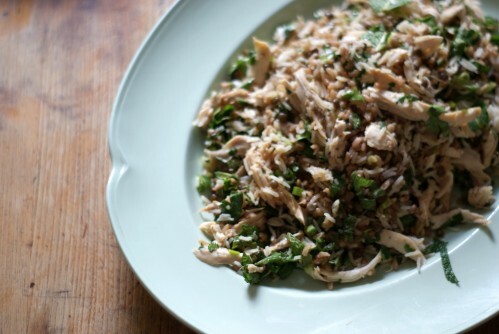 To assemble the salad, pour the dressing over the shredded roast chicken. Add the remaining ingredients and mix well. Pile the salad onto a large serving platter. Mmm, that looks scrumptious. I’ve got the Ottolenghi book but there’s just so much to choose from. I think this might have to be the next thing I make from it though! OH what a lovely website, really it is, I’ve spent far too long meandering through its luscious paths. HOWEVER….can I make a contribution which is to suggest that if you put how many each recipe was intended to feed it would be marvellously helpful to enthusiastic but beginner cooks like me who wonder how a gram of this or a cup of that translates into plates and tummies……. Hi, A friend made this for me recently. It was delicious, and I would like to make it for my family, but my son is allergic to fish. What sauce can I substitute for the fish sauce? Hi Julia, you could try soy sauce instead? Maybe add one tablespoon at first and then more to taste?